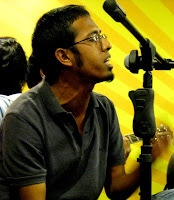 A Chemical Engineer, presently based in Bangalore and the 'lead vocalist' of Eastern Fare. An ardent and enthusiastic supporter of Rock n' Roll, Siddharth is known as the 'Encyclopedia of Rock Music' among his friends. Can you please share your album here.